During the hunting seasons, Indian tribes confront one another in order to establish which of them is the most prestigious one. They hunt for very high stakes: Buffaloes, Tipis, Horses and the Sacred Totem. 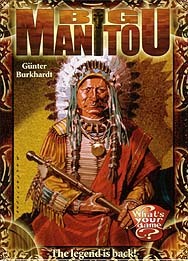 The player who will play their own Hunter and Hero cards cleverly and with skilfulness will be the winner.... with Manitou's help!